The Portuguese was talking about his predecessor Manuel Pellegrini, who headed to the Costa del Sol to rebuild his reputation after a sole season at the Santiago Bernabeu. Two years on, however, Malaga are flying high at home and abroad while Mourinho’s Madrid lick their wounds having already lost six matches in 2012-13. So was Mourinho really an upgrade on Pellegrini? The numbers indicate he may not have been. 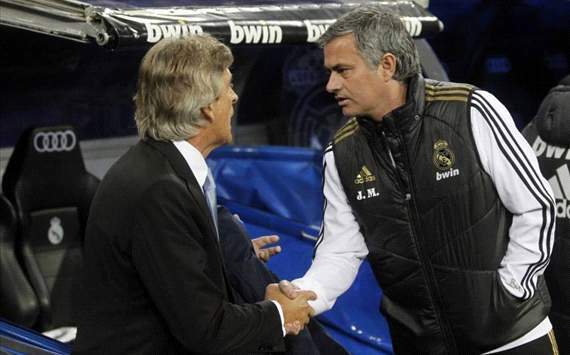 In one campaign at Madrid, Pellegrini led the capital club to their then-highest points total of 96, only to lose out to Pep Guardiola’s brilliant Barcelona, who claimed three more in 2009-10. Nevertheless, the total was four better than Mourinho managed a season later, and that after the Portuguese had been given practically free rein to sign the players he wanted. However, when Madrid missed out on the Champions League with a shock second-round exit against Lyon and were humbled by lowly Alcorcon in the Copa del Rey, they couldn’t shoot the piano player. So they pushed Pellegrini. Mourinho, of course, came with high pedigree, having won the Champions League with both Porto and Inter. Here was a winner who was just what Madrid needed to bring down the best-ever Barcelona side in history. And it’s hard to argue with that hypothesis, even now. The Portuguese, after all, has claimed three trophies in his spell of just over two seasons. His first year brought the Copa del Rey, while the second saw his side break both the points and goals records in La Liga to beat Barca into second place. His Madrid team have also reached back-to-back semi-finals in the Champions League, something which had not occurred at Real since the Vicente del Bosque era. With time to work, the backing of the board and the chance to bring in the players he felt could balance the squad, however, Pellegrini may have gone on to achieve similar success. Additionally, his brand of attacking football was more in tune with what most Madrid fans feel should be their side’s style of play – a passing and possesion philosophy more similar to Barca’s than their current counter-attacking game under the Portuguese. Mourinho has brought titles to the club, though, and may yet win the biggest of them all, the Champions League, which has become the ‘Holy Grail’ for Madrid fans in recent years. Soon enough, we will find out. With Pellegrini, we sadly never will – at least while Florentino Perez is in charge. But his win percentage proves he may have been just as successful at Real Madrid.